Our Rotary Club has been a long-time supporter of opportunities through Boys Scouts for youth in Trenton. 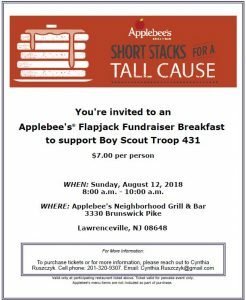 The following is an invitation to a fundraiser – please consider eating your breakfast at the Lawrenceville Applebee’s® on Sunday, August 12 if you are in town! On August 12, we will be holding a Flapjack Fundraiser and we would like to invite Trenton Rotarians. Our goal in this fundraiser is to raise enough money to purchase a trailer to store and transport equipment for camping events. In the winter, BSA Troop 257 in Trenton closed and we acquired their scouts. Our scout total is up to 16 boys and transporting equipment and boys at the same time does pose some challenges. We are hoping with the use of the trailer, things will become easier. If members/supporters are interested in attending the event, please feel free to provide them my email address (Cynthia.Ruszczyk@gmail.com) or I can be contacted at 201-320-9307. If possible, we would like to have all tickets purchased by August 3rd to give Applebee’s an accurate headcount.